Beth Martin Books: Comic Cons, Here I Come! Comic Cons, Here I Come! 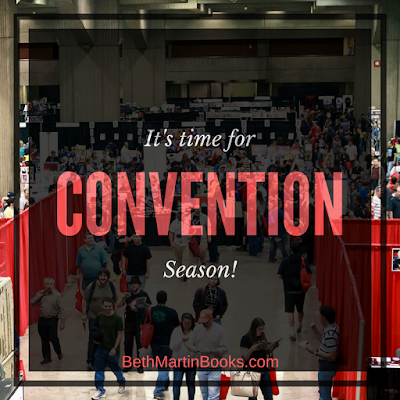 When I learned that there was a comic book convention close to my home, I knew I'd be going. I've only been to a couple conventions in the past--this little one in Atlanta called Dragoncon and Blizzcon one year back when we lived in California. I'm really excited for this upcoming one because it's family friendly (and I have kids now) and won't be the same mega-scale as the others. I can stand hundreds or thousands of like-minded people, but tens of thousands of fans crammed in the same venue gets a little claustrophobic. Also, there's the fact that I am an author now which gives events like this a whole new level. I'm now a content creator, which means this would be an excellent opportunity to share (ehem, SELL) my novels. Naturally, my first instinct was to sign up for a table. Being a total planner--I've already done a bunch of research on what's needed for tabling at an event. I've mocked up a banner and signed up for PayPal Here. I also got a sellers' permit so I can charge tax in my state (yay?). I've got carts full of goodies on Amazon and VistaPrint. I'll keep you all posted on the details of all my convention activities. I'll announce when I have more plans made!